Check Inman every day for the daily version of this market roundup. The home price index was up 6.7 percent year-over-year in November 2016. The cash sales share was 31.8 percent as of October 2016. The distressed sales share was 7.7 percent as of October 2016. The average interest rate on all mortgage loans was 3.91 percent, up 27 basis points from 3.64 in November. The average interest rate on conventional, 30-year, fixed-rate mortgages of $417,000 or less was 4.08 percent, up 28 basis points from 3.80 in November. The average loan amount for all loans was $319,100 in December, up $4,400 from $314,700 in November. The frequency of defects, fraudulence and misrepresentation in the information submitted in mortgage loan applications increased 1.5 percent in December as compared with November. Compared to December 2015, the Defect Index decreased by 9.2 percent. 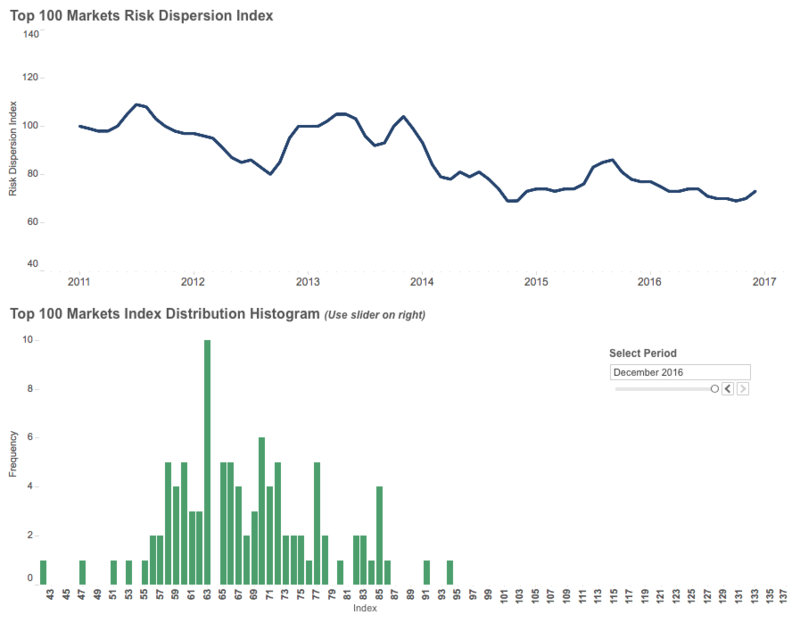 The Defect Index is down 32.4 percent from the high point of risk in October 2013. 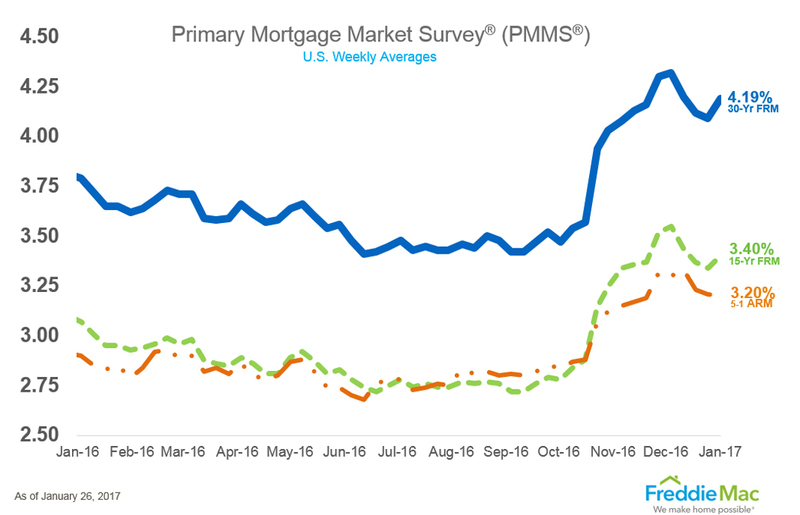 30-year fixed-rate mortgage (FRM) averaged 4.19 percent with an average 0.4 point for the week ending Jan. 26, 2017. This is up from last week when it averaged 4.09 percent. A year ago at this time, the 30-year FRM averaged 3.79 percent. Sales of new single-family houses in December 2016 were at a seasonally adjusted annual rate of 536,000. This is 10.4 percent below the revised November rate of 598,000 and 0.4 percent below the December 2015 estimate of 538,000. The median sales price of new houses sold in December 2016 was $322,500; the average sales price was $384,000. U.S. house prices rose in November, up 0.5 percent on a seasonally adjusted basis from the previous month. The previously reported 0.4 percent increase in October was revised downward to a 0.3 percent increase. From November 2015 to November 2016, house prices were up 6.1 percent. Mortgage applications increased 4.0 percent from one week earlier for the week ending January 20, 2017. The refinance share of mortgage activity decreased to 50.0 percent of total applications, the lowest level since July 2015, from 53.0 percent the previous week. 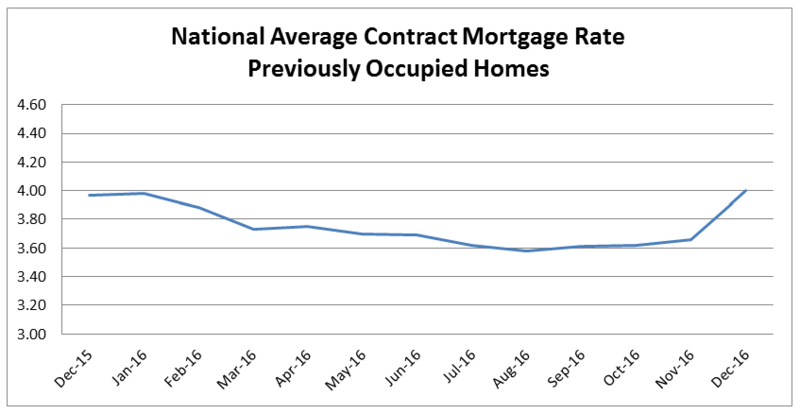 The average contract interest rate for 30-year fixed-rate mortgages with conforming loan balances increased to 4.35 percent from 4.27 percent. Total existing-home sales finished 2016 at 5.45 million sales. In December, existing sales decreased 2.8 percent to a seasonally adjusted annual rate of 5.49 million in December from an upwardly revised 5.65 million in November. With last month’s slide, sales are only 0.7 percent higher than a year ago. 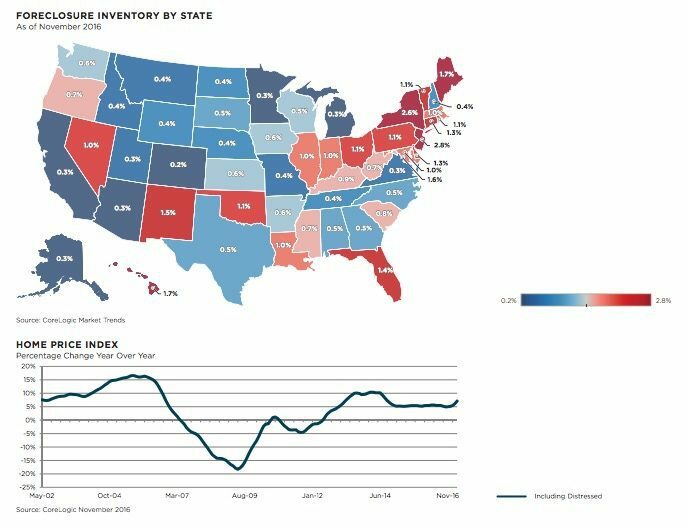 Months of remaining inventory (MRI) — the current number of active listings divided by the monthly sales rate — is around 6 months in a balanced market. Communities with an MRI under 3 have jumped from 12.7 percent in December 2015 to 20.63 percent in December 2016 — a 62.44 percent increase. In December 2014, this number was 9.17 percent — there’s been a 125-percent increase in communities with a dramatic shortage of homes for sale since December 2014. 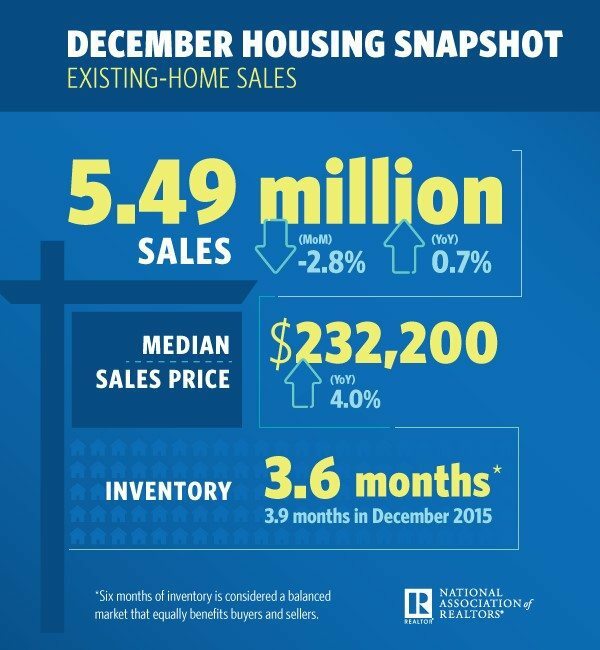 Potential existing-home sales decreased to a 5.8 million seasonally adjusted, annualized rate (SAAR). This represents a 92.5 percent increase from the market potential low point reached in December 2008. In December, the market potential for existing-home sales grew by 2.9 percent compared with a year ago, an increase of 164,000 (SAAR) sales. Email market news to press@inman.com.